Crafted from dyed leather and enamel, Swiss studio Kueng Caputo’s Never Too Much series may be named for the liberal and layered application of colour. 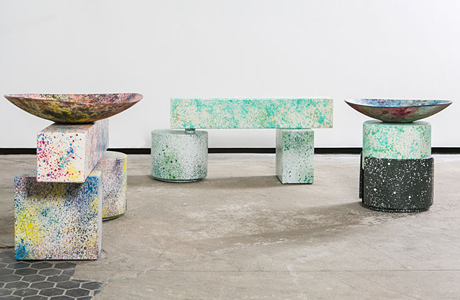 Splashed with organic vegetable stains, the collection is a mix-and-match splattered series of hand-painted stools, benches, bowls and lamps. “The final result is as beautiful as the passing of time,” Sarah Kueng explains. The studio, formed by the duo of Lovis Caputo and Sarah Kueng, will be debuting its collection at New York’s Salon 94 Freemans 2014.